No one is more fun like Gaston! 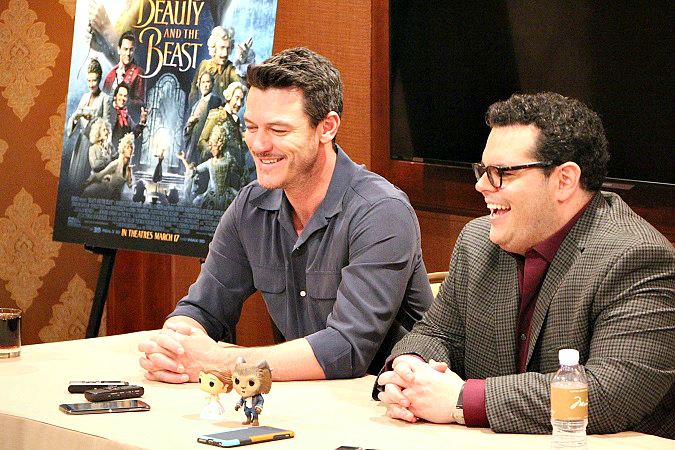 We sat down to an exclusive Beauty and the Beast Josh Gad & Luke Evans Interview that was beyond all expectations. This post is sponsored by Disney as a part of the #BeOurGuestEvent press junket. All opinions are my own. 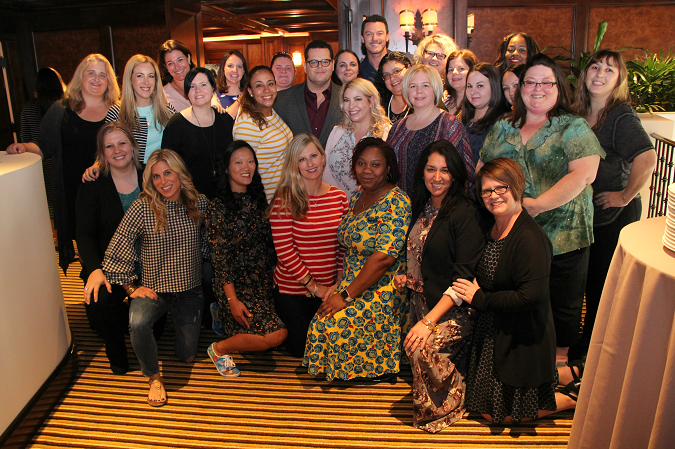 Gaston, LeFou and 25 bloggers walk into the Montage Hotel…sounds like the beginning of an amazing joke. We were just coming down from our high of seeing Luke Evans and Josh Gad perform a rowdy rendition of “Gaston” live with Alan Menken when these two men walked very arrogantly into the room. Oh, this is going to be good. 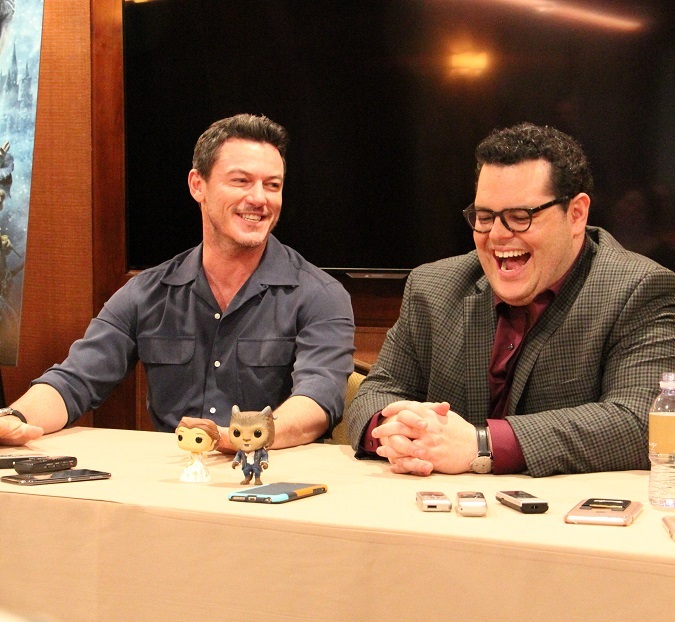 Gaston and LeFou are causing trouble on and off screen in one heck of an interview today. Find out what makes these actors the villains you love to hate in Disney’s Live-Action Beauty and the Beast, shenanigans going on behind-the-scenes, why LeFou has a bigger role and more. It was an instant pull of the heartstrings when Josh Gad said that. I get choked up just thinking about it. 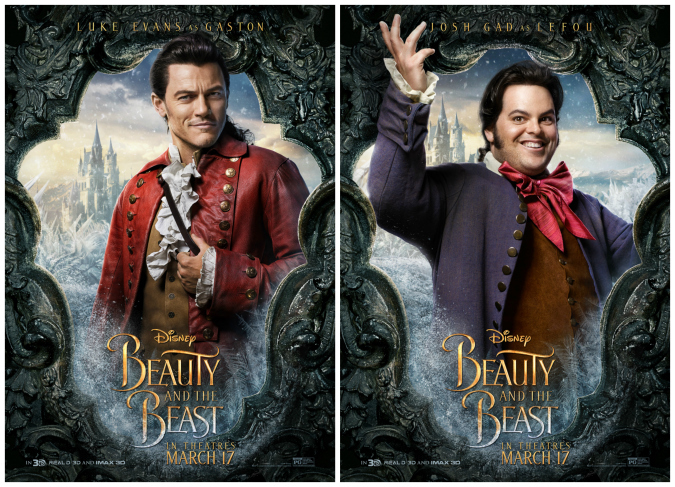 Luke Evans and Josh Gad really had a heart for making sure that they did these roles right. Having both grown up with Beauty and the Beast – being a part of this film was so much more than a job, it was a dream come true. Luke Evans: First of all, we were massive, massive fans of the original. We were both kids when they came out. He was 10, I was 12. I was in South Wales, he was in South Florida. The climate was rather different. It meant even more to me ’cause it was always dark and gloomy where I came from. So to go in and watch a Disney film in the little cinema in our village was the highlight of my year! Always was. To bring them to life, we both felt very lucky. Josh Gad: You’re always hoping when you get paired with somebody, it’s all about the chemistry between the two characters. The day I met Luke, I didn’t even realize we both came from musical theater. Luke from the West Side, me from Broadway. We have this common language and this common understanding. And this common goal of wanting to do justice to a movie that was so – I cannot stress this enough – so pivotal in our childhoods. The second golden age of Disney animation from LITTLE MERMAID to BEAUTY AND THE BEAST, to ALADDIN then to LION KING, defined my growing up. They really did. Those Alan Menken/Howard Ashman songs, they really were the soundtrack to my childhood. BEAUTY AND THE BEAST was my FROZEN. So bringing a song like Gaston to life, that’s like a dream come true. “Gaston,” everyone knows that song. But looking closer, you don’t realize how complicated that song would be to execute in real life. People flying across the room. Perfectly choreographed movements. Swords, dancing on tables – and one arrogant man in the middle of it all. Josh and Luke offer just a glimpse into the passion and technical difficulty that went into this pivotal song’s execution. Luke Evans: It was the one piece of the whole film where we got to rehearse for four to five weeks. It was incredibly technical. We had all the villagers in the room. There’s vignette stories going on (which you have to watch it a few times to know that), that took a lot of time. The music was playing throughout the whole thing. There was swords; murals that we have to reflect in the back of each shot. It was a lot of stuff going on, which took time and development and collaboration. Luke Evans: Two years. The other night when we had the world premiere here in Los Angeles. And people clapped at the end of our number. I mean, it’s crazy. We’ve done what we needed to do here. We are taking people out of the world in which we live, and made them escape into this wonderfully technical emotion of this story, which we are really proud of. 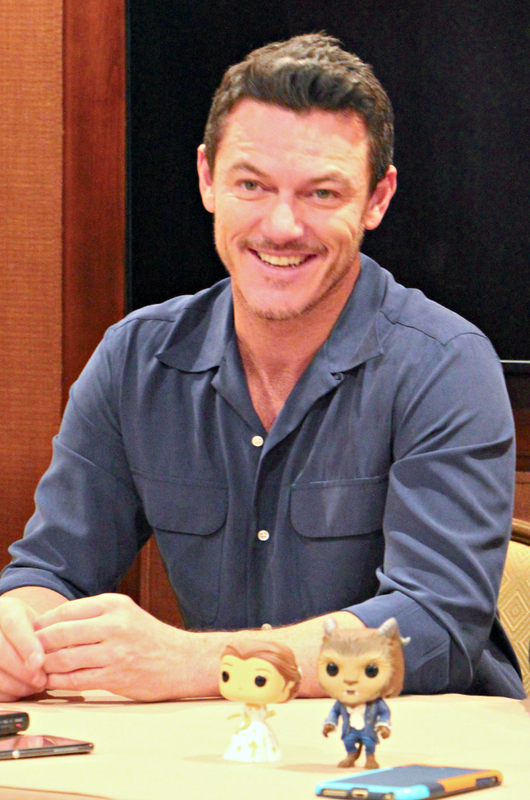 First of all, can we talk about how Luke Evans’ dreamy smile can melt a girl’s heart into a puddle of goo? Front row, folks. Front row. How does Luke Evans embody someone as handsomely sinister as the iconic Gaston? It’s all in the details. A massive part of my creation of a character, especially somebody like Gaston – the look is half of his ego. The hair and the fitted red leather. We went [through] about four or five incarnations of that leather jacket before we found the right color of blood red. That represented the sinister part of his nature. 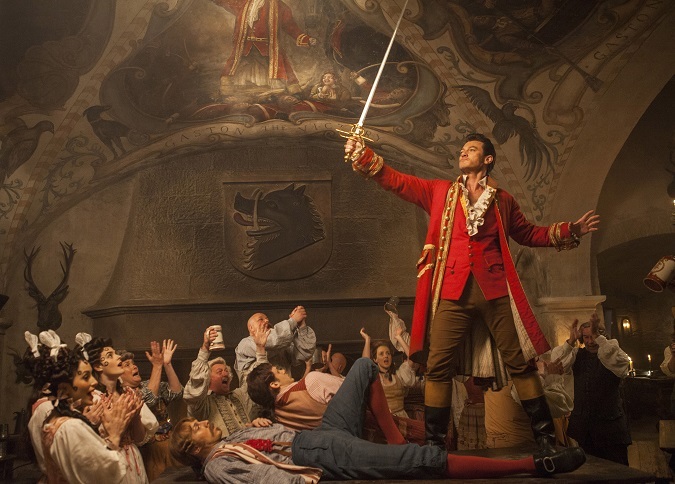 That red jacket is obviously so synonymous with Gaston in the original. And it’s the same here. That [jacket] only goes on when he puts Maurice into the carriage to lock him up. That’s the first time you see it. We made that conscious decision. When you put something on like that, there was so much work in it, those buttons all had antlers on each button. And I had a pinky ring which was an antler impressed into red stone. It was all antler themed, as you can imagine. It looked fantastic. You put the wig on and there you go. LeFou gets an expanded role in the new Beauty and the Beast. Josh Gad really wanted to ensure that LeFou had an extra character dimension that went beyond just a movie recreation – and a few surprises. 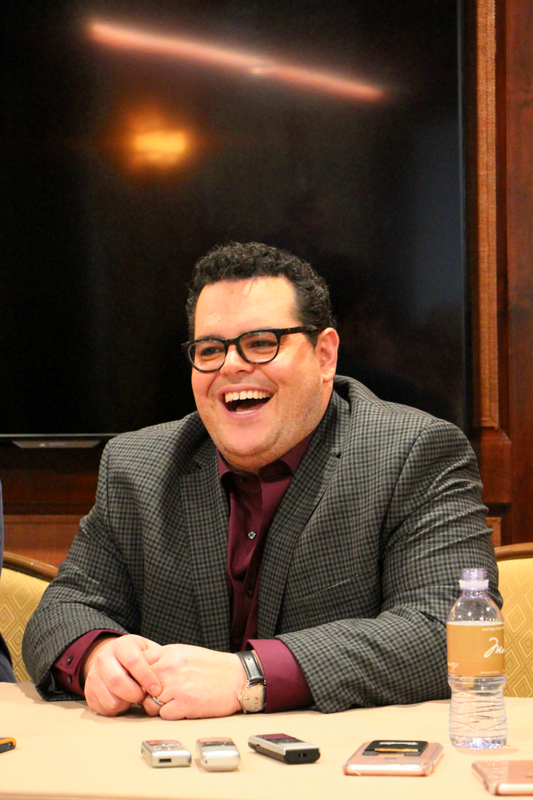 Josh Gad: For me it was about adding dimension. One of the things that I really loved about LeFou in this particular version is, he does have this interesting arc where he starts to question the blind devotion that he has to this person who, during the course of the film, turns into the real monster. That was such an interesting thing to play. We didn’t want to just literally recreate a movie that, in of itself is pretty perfect. You can’t do that. You have to add. You have to keep building on the legacy of that which everybody is awaiting and looking forward to. But also give them new surprises. For us the new songs, the new moment, all of it adds up in its collective experience that feels old in the best way. But also new in an amazing way. Improv seems to be their specialty. 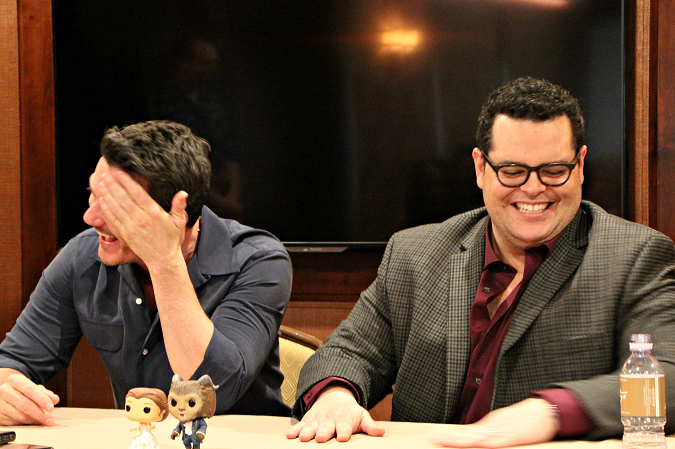 Josh Gad admits that there were A LOT of antics going on behind-the-scenes between Gaston and LeFou. More surprising was when they realized a few on the spot moments made the cut of the film. The first sequence, when the two of us are riding in that wagon with Maurice. That whole idea of calming Luke down with stories about the war was something that we literally came up with on the spot. And we had about like 30 variations of it. Some of them were even more insane than what you see on the screen. There were some great scenes when we come into the village. Remember, when Belle’s in trouble and we come in? “It’s hero time!” We come in, and Gaston hands me his gun. And the gun goes off in my hand. You just hear a cow die in the background. It was such a funny moment. The end of Gaston, I literally did about 30 different versions of that. And then the one that they chose was the I just realized I’m illiterate. Every time we shot it, it was different. ‘Cause every time my goal was to make Luke laugh. We got him in trouble. But there were so many opportunities. There’s also a lot of stuff on the cutting room floor, that I hope you’ll see on the Blu-Ray and the Extras. This had to be my favorite part of the interview. Not only was it my question (ahem), but this is the version of Beauty and the Beast that my kids will grow up with. What will this version of Gaston and LeFou portray as this generation grows up? Josh Gad: This is gonna be for many of your kids and my kids certainly, the first time they ever see a musical screen that isn’t animated. That’s huge. I think that Gaston in particular, represents a really interesting character. Because there’s I think one of the most important lessons to be learned, comes surprisingly out of that character. Which is, you have a guy who is provoking fear, based on a character that nobody knows. That people are scared because they’ve never seen him. But they’re afraid of what he’s capable of. Feeding into those fears and going to attack someone, based on the fact that you’ve never met them before but what you believe they’re capable of. That’s as relevant today as it was when Beauty and the Beast was first written. And I think that is the thing that I hope kids can look at. They’re not gonna understand it now. But that’s something as they revisit this film over and over and over again – this idea of never judging a book by its cover, is so important. That’s what I would say I hope they take from it. Luke Evans: Love conquers hate. That’s basically the running theme. And to watch it all being carried by a very strong female lead character who basically at the end of the day, she saves the Prince. Multiple times, you know. If it wasn’t for her, this story wouldn’t have the backbone that it does. It comes from a very fearless, independently spirited young woman who reads, who’s intellectual, who wants to learn, who sees that there are no boundaries to her world. She knows there’s a world out there to conquer and to discover. And she doesn’t need a man to do it. Belle, in this version, [is] a brilliant role model for young ladies and young boys as well. It was a honor to meet Josh Gad (he’ll always be Olaf to me!) and Luke Evans, perfectly cast as LeFou and Gaston in Disney’s Beauty and the Beast. See your favorite “bad guys” come to life in Disney’s Beauty and the Beast, in theaters starting this Friday, March 17, 2017. 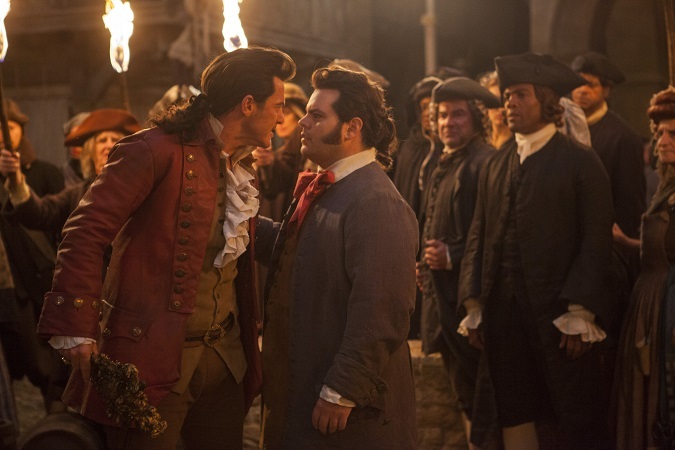 Are you rooting for Gaston and LeFou in the new Beauty and the Beast movie? I was invited to attend an all-inclusive press trip, with post sponsored by Disney. Be sure to follow Raising Whasians via Facebook, Twitter, Google, Instagram, Pinterest and YouTube for more Disney insider information, movie updates and entertainment!